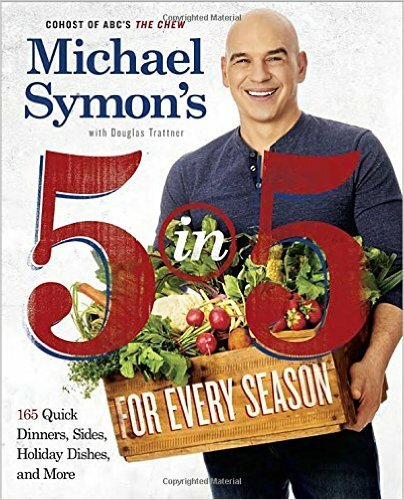 My latest book review is for Michael Symon’s 5 in 5. This is the updated version of his 2013 book of the same name. The premise of the book is that you can make appetizers, main courses or dessert from just 5 main ingredients and cook in 5 minutes! Yes! FIVE minutes! The prep for the food is not included in the 5 minutes yet it is still not a lot of time and can be prepared ahead and stored in the fridge. This recipe book is 165 dishes that taste delicious with few ingredients. I love how the main 5 ingredients are highlighted and easy to add to a grocery list. There are other ingredients in every recipe, however, they are all common pantry staples like olive oil, salt, pepper, etc. I like that the book is organized by season. This book takes the produce that is in season and uses them such as Kielsbasa with Apples and Onions in the Fall, Grilled Chicken Thighs with Edamame and Grapefruit in Winter, Grilled Corn with Parmesan and Chives in the Summer, and Asparagus with Sesame and Orange in the Spring. A holiday section is the last chapter and includes Roasted Brussel Sprouts with Bacon and Leftover Turkey Frittata. If you are stuck in a food rut, want to try new things, like cooking from scratch and not the boxes – this book is for you. 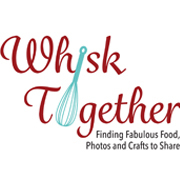 Many recipe books that promise short ingredient lists rarely deliver because they include using many cream of something soups or boxes of pre-made ingredients that include preservatives. Michael Symon’s book is all from scratch recipes full of flavor. Most of the recipes include a photo as well! As I mentioned previously, this book will require that you may try new things. Radicchio, endive, shaved beets, kohlrabi and feta cheese are not every day normal ingredients I would pick up at the grocery store. I’m not sure many families with small children would use many of the recipes. Then again, this is a book of fast and easy recipes with a lot of vegetables and fruit pairings and a life saver for those hurrying home from work and need to get dinner on the table quickly. Recipe: Speaking of getting out of the recipe rut- I made this North African Beef Stew thinking it would just be okay. But it was super delicious! 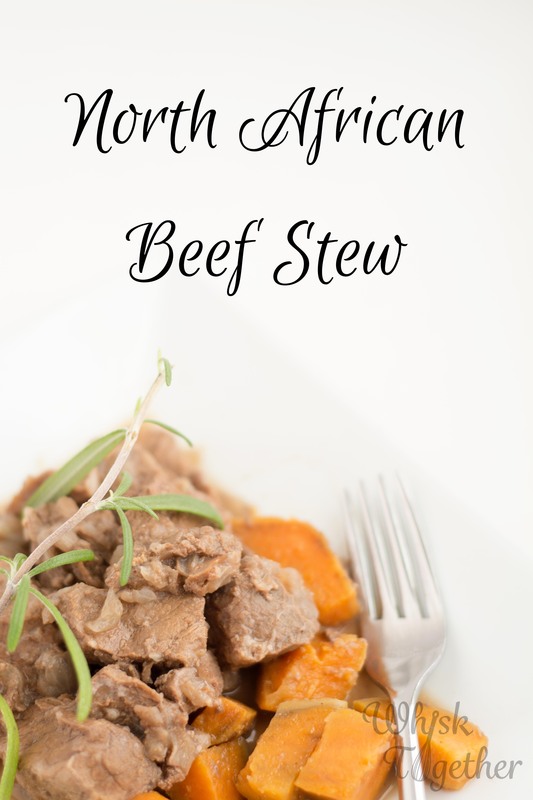 I had everything for it in the pantry and just wanted to make something a little different than the same old same old adding russets, carrots and celery to the beef stew meat with some broth, thyme and tomato paste. If you don’t care for adding cinnamon to your beef (don’t knock it until you try it! It’s surprisingly good), then take note of the directions. 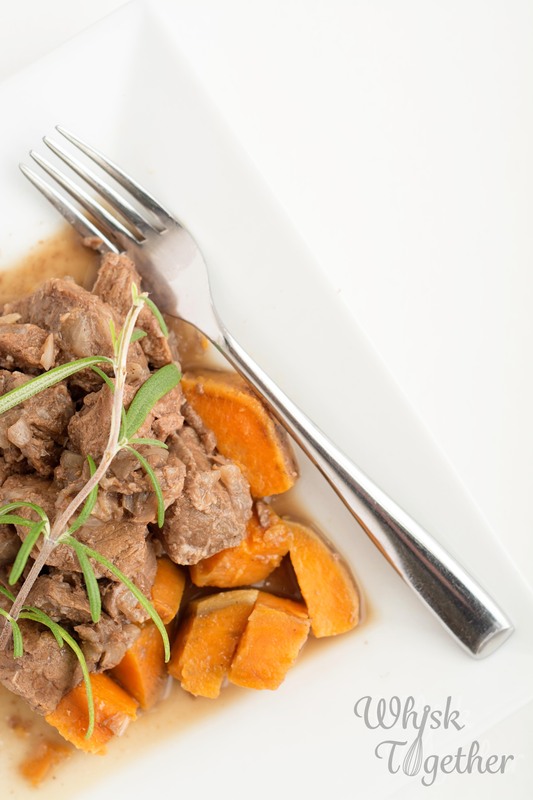 Putting your potatoes in foil on top of your beef stew keeps them tender, but not mushy. It is how we always make our stews or anything with potatoes in the slow cooker now. In a medium microwave safe bowl: add the onion, garlic, spices and oil. Nuke that for 5 minutes on high. Stir every once in a while. Into a 4-7 qt. slow cooker: put the onion mixture, broth, 1/2 tsp. salt and meat. Into a foil packet: add the potatoes. Put the packet on top of your meat. Cook 9-11 hours on low or 6-8 hours on high. Option one: Serve potatoes and beef separately. Option two: Dump the potatoes into the beef slowly and stir. Option three: Remove a cup or two of the potatoes from the foil packet and mash them with a masher. Add the mashed potatoes and whole potatoes into beef. Heat for about 15 minutes or until everything is warm. Add salt and pepper as needed and serve warm!